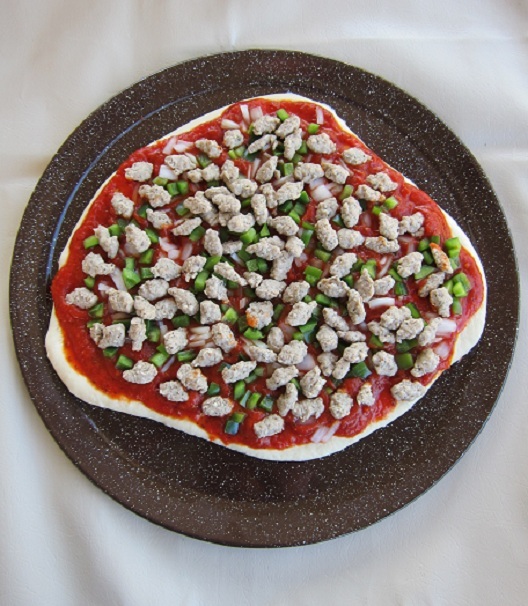 For this week’s review I was sent the KettlePizza from George Peters Jr. at KettlePizza. 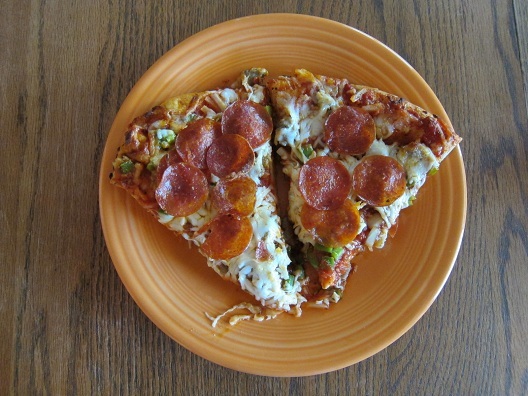 KettlePizza started in early 2010 when owner Al Contarino came up with a new way to cook pizza on a Weber kettle grill. Builders at heart, Al and his business partner George Peters Jr. took on the challenge to design, manufacture and sell the KettlePizza right out of Al’s barn in Massachusetts. Customers responded and they soon had to move to a new manufacturing and distribution center in Groveland, MA. They’re also very proud that their core products are designed and manufactured exclusively in the USA and are now shipping all over the world. 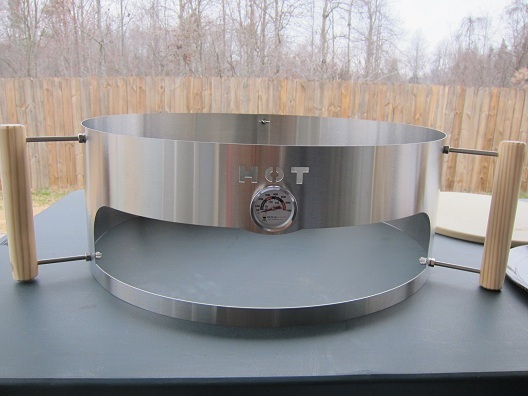 The KettlePizza is an American Made stainless steel sleeve that turns your kettle grill into a wood fired pizza oven. 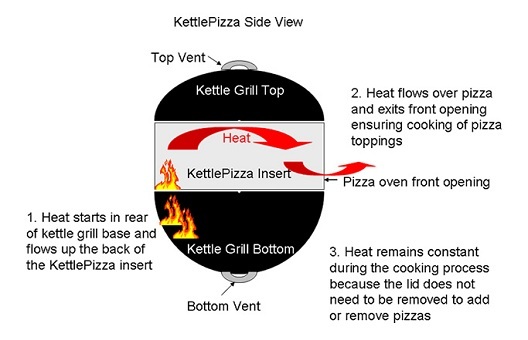 The KettlePizza fits between the kettle grill top and bottom creating a cooking chamber. The opening in the front allows access to that chamber. The heat comes up from the back of the kettle, along the rear of the cooking chamber and over the top exiting at the front opening. This setup creates a consistent heat loss that flows over the top of the pizza ensuring properly cooked pizza toppings. 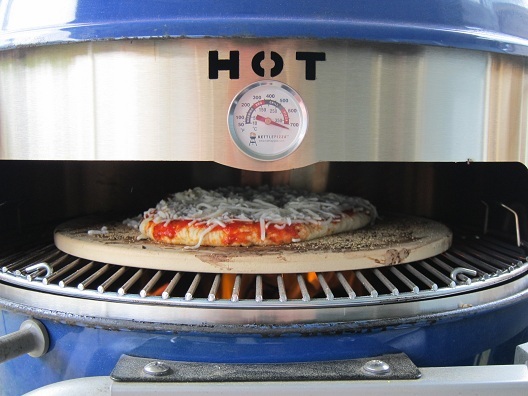 The KettlePizza can maintain consistent temperatures upwards of 750 degrees with the use of charcoal and hard wood. I was really impressed with how easy the KettlePizza was to put together. I was able to put it together in around 5 minutes without the use of any tools. 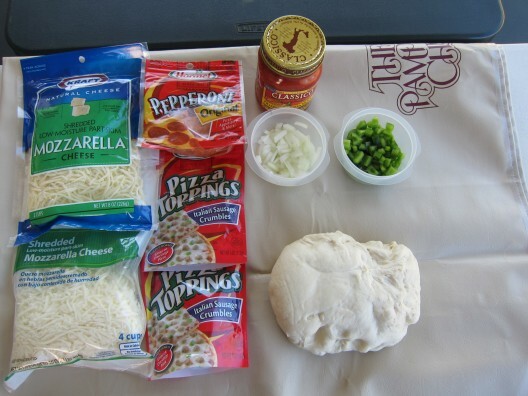 Once the KettlePizza was all put together it was time to start making some pizza. I gathered all the ingredients and brought them outside. I then lit a full charcoal chimney while my father was working on the first pizza. Below is a picture of my father rolling out the dough for the pepperoni pizza. 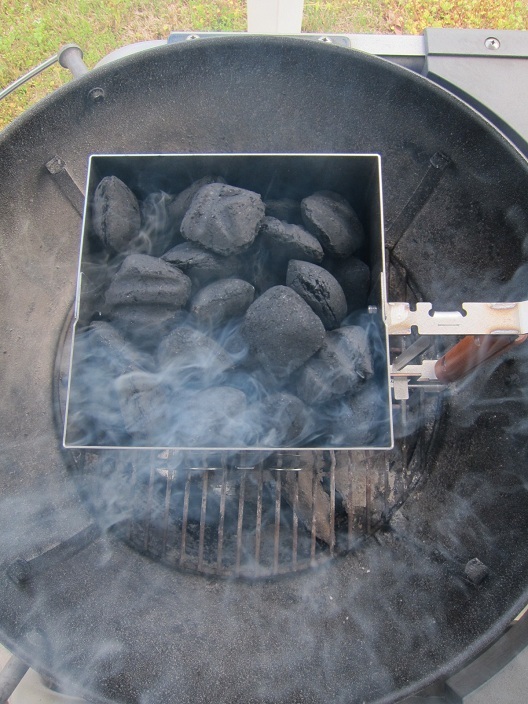 When the charcoal was good and hot I used a really cool new charcoal chimney with a drop out bottom to drop the coals in the bottom back of the grill and then placed in some cherry Mojobricks Bar-B-Qubes on top of the hot coals. Love the Mojobricks! 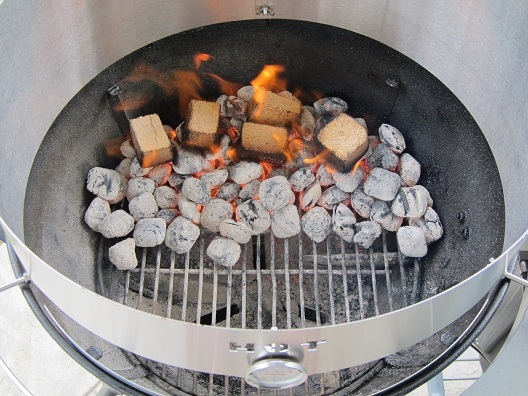 After that I put the grill grate in-place and then the pizza stone on top of that followed by the Weber kettle lid. I adjusted the vents as needed until the KettlePizza thermometer topped out at over 700 degrees. 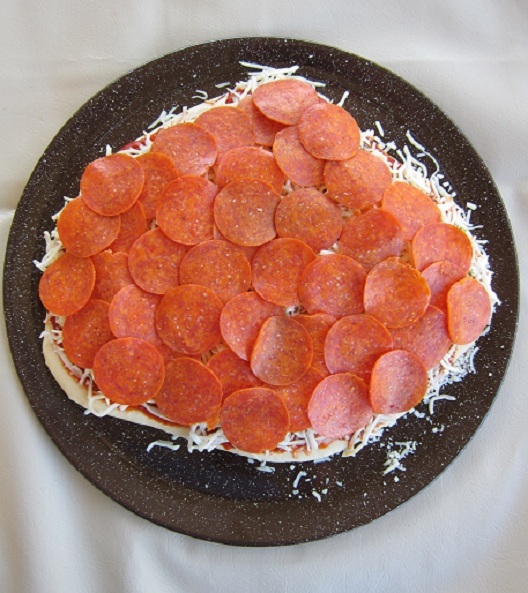 Then I threw in some cornmeal on the top of the pizza stone and used the pizza peel to slide the pepperoni pizza onto the stone. Half-way through the roughly 7 minute cook time I used the pizza spinner tools to rotate the pizza 90 degrees. 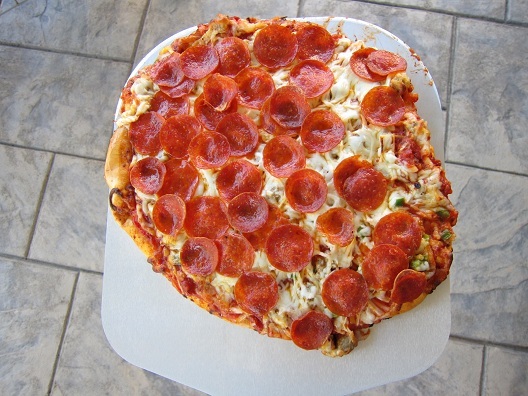 Once the pizza was finished cooking I used the pizza peel to remove it from the grill and placed it on a pizza pan. Next up was the sausage supreme pizza I made (minus the mushrooms). 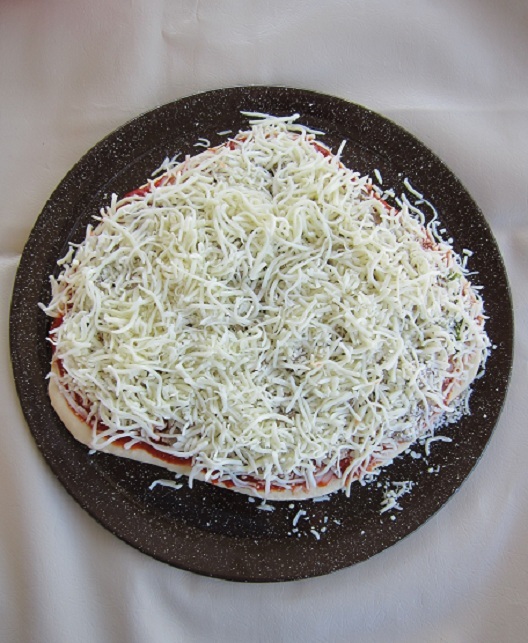 Below are some pictures of the making of that pizza. I followed the same steps as with the first pizza above and once it was done cooking it was time to come off the grill. I really enjoyed the great wood fired taste of the sausage supreme pizza. 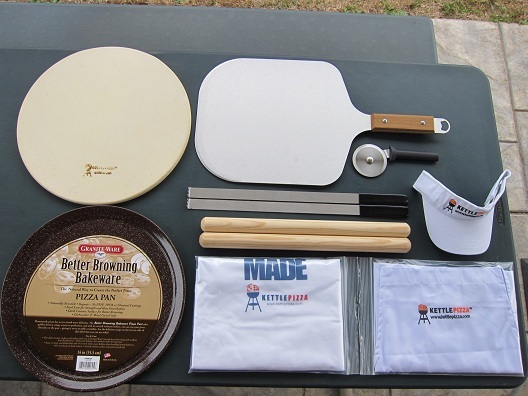 The KettlePizza is a great quality, American Made product for people who love the wonderful taste of wood fired pizza! 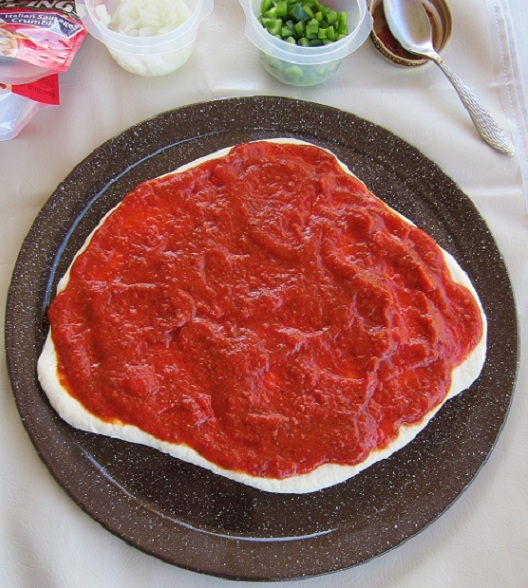 I really enjoyed spending time with my family making homemade pizzas on the KettlePizza. 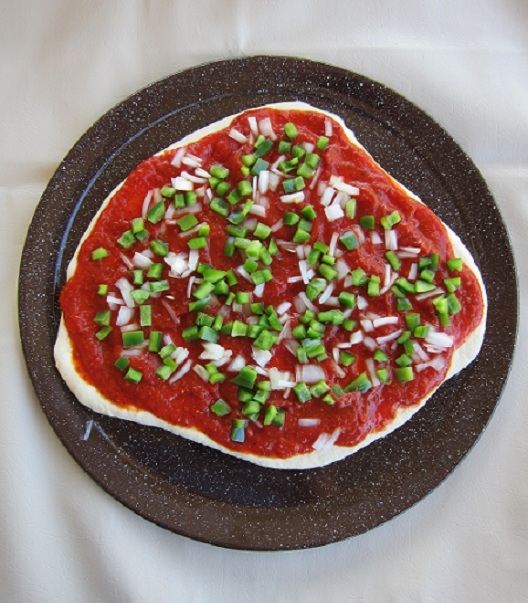 It’s a product that works extremely well and is the perfect device for home pizza making. You can find a great deal on the KettlePizza here . For more information on the KettlePizza please visit their Facebook & Twitter pages as well as their Website. nice smile on your daughters face but not enough sauce. Thanks Doug! I sent ya an email! Thanks again for leaving a comment! 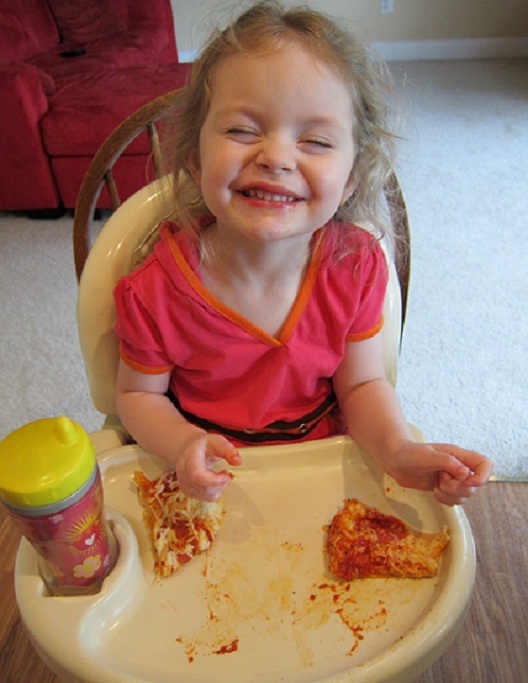 Yeah she has been asking me every day for pizza since I made those lol. 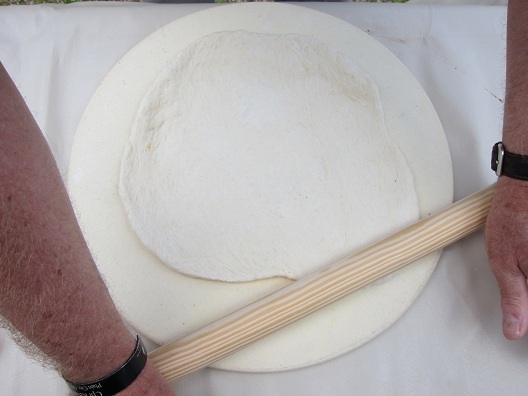 It’s a great product and who doesn’t like a good wood fired pizza! Thanks again for leaving a comment Chris! I like this review! Do they have anything available for the 18.5″ kettles? 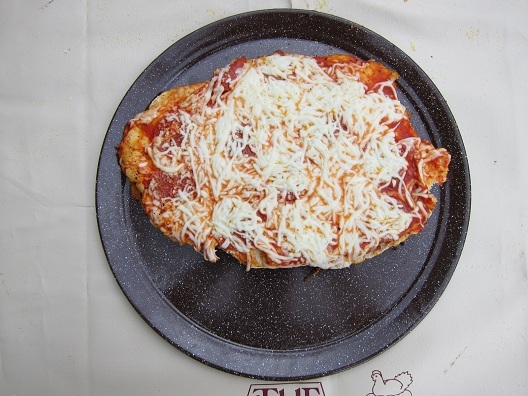 Also, how would you rate the quality of the provided pizza stone? 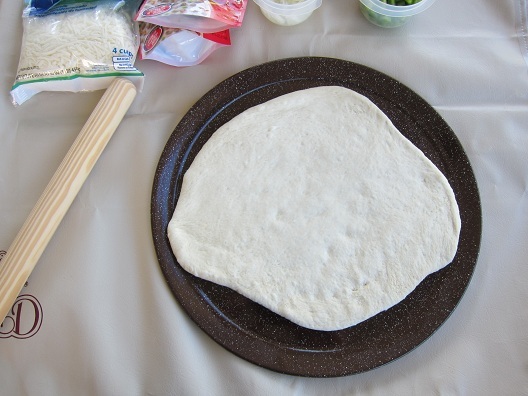 As for the pizza stone, I think it’s a really great quality stone! Plus it’s hand made here in the USA exclusively for KettlePizza. Thanks again for leaving a comment Wayne! Thanks again Denise! I am really glad you liked my review on the KettlePizza! Thanks for leaving a comment Denise! 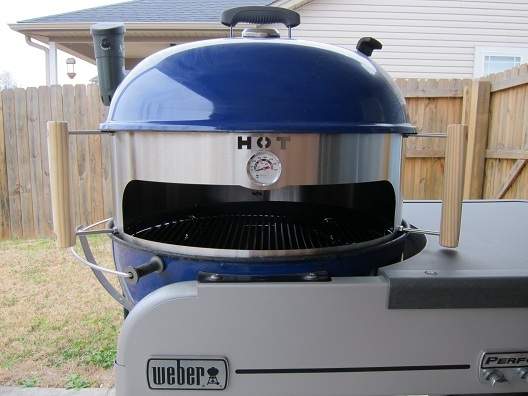 I have to say I have all other Weber attachments but this looks like a must have! Great review Jay! Thanks so much Mike! The KettlePizza is an awesome product to own. Thanks for leaving a comment! Thanks Kevin! Congrats on the new kettle! This would be a great product to have for use on that new kettle. I also think they are priced just right too. You can make some awesome wood fired pizzas on the KettlePizza! Thanks for leaving a comment Kevin! Jay, awesome review on this thing! I have seen them online but never really seen one in action. Looks like it actually takes the Weber kettle to a new level in this realm. Fantastic work! Thanks so much John! I’m loving the KettlePizza! If you love a good wood fired pizza definitely consider buying this product. I’m glad this turned out so well. I was skeptical how well it would turn out, but then again it’s pizza. I don’t know if there is such a thing as bad pizza. Might have to check this out as a possible option. Thanks for leaving a comment Jericho! The KettlePizza does help to produce some great wood fired pizza and is well worth the price in my opinion!